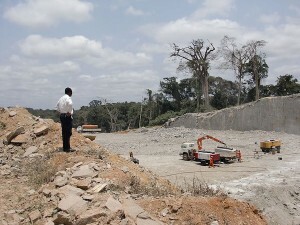 A road is carved out of the forest in the soon-to-be new capital city of Oyala. Photo by Mehlauge. More than 8,000 hectares of rainforest are under threat as the nation builds a new $600 million capital city from scratch. Called Oyala, and also known as Djibloho, the city is expected be completed by 2020 and house up to 200,000 people — about an eighth of the entire population of Equatorial Guinea. This report was originally published in Mongobay and it is republished by an agreement to share content.